If you’ve lived with a cat, you know that making our lives easier is most certainly not on their agenda. They are great communicators in some aspects – when he’s hungry, you will be informed in no uncertain terms, particularly if it’s 5am. Some cats clearly show their disdain at the litter box not being up to standard. If they are so good at sharing their feelings, why do they hide their pain so well? It goes back to their origins as both predator and potential prey. The cat that is limping, lethargic, or showing any weakness basically looks like a target to a larger animal who may want to eat it. So, survival instincts dictate concealing pain. Besides, when have cats ever tried to make our lives as owners and veterinarians easy? There are signs that give away their painful secret – you just have to know what to look for! This is related to the lack of jumping. If your cat chooses a new place to sleep that is on or close to floor level, there could be a reason. If it’s too painful to go to the usual spots, they’ll pick new ones. Is the litter box in the basement? Is the litter box covered or tall? Are there barriers to the litter box to keep other pets out? For older, arthritic pets, these seem like minor details, but they can be deal breakers! Some litter boxes are 8 inches tall – imagine having to climb a wall almost as tall as you are to use the toilet! On a similar note, heading down and up a flight of stairs is a journey when jumping up every single step is accompanied by pain! Grooming, especially the back half, requires some bending and downright yoga-style moves. Cats with arthritis often are not able to groom as well as they used to. If you notice tangled hair (mats) forming on your cat, have her checked out – she likely is stiff and painful. Another possibility – some cats are so obese they simply cannot reach! Also, cats with mouth pain (dental disease or oral cancer) often will skip grooming. When cats are sick for a variety of reasons, the most obvious sign they often give us is hiding. It’s a vague sign, but if your cat starts hanging out in out-of-the-way places, or avoiding contact, have her checked out by the vet! This is a subtle one, but it’s huge! Cats that feel like total crap take a traditional “I hurt” posture. It’s often sitting curled up with the neck flexed down, back slightly arched, staring at the floor. It’s almost like they are curling up into a ball. 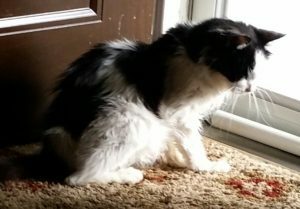 I see this in cats with more just arthritis, but major disease that makes them feel like the worst flu you’ve ever had, times 100. Cats in severe kidney failure or liver failure often have this posture. If your cat always wakes up at 6am and wants to eat, then stops doing that, there’s a sign. If she greets you at the door and no longer does, or used to love to cuddle and you’re now alone, those are also big signs. Notice crying or moaning in pain was not on this list! Cats hide their pain, so moaning, crying, or wailing rarely happens. Don’t wait for that before you think your cat is hurting. Cats can vocalize for other reasons, such as dementia, hyperthyroidism, or hypertension. If your cat is vocalizing more, a visit to the veterinarian is in order! Just know there will likely be more to it than pain. Another obvious sign is a change in appetite. This might not always be obvious in multi-cat households, where the food is down all the time and everyone eats when they want. It’s very hard to tell who is eating what in these cases, but make sure everyone visits the food bowl daily as far as you can tell. Weight loss often accompanies appetite loss, but with cats, loss of a single pound is a big deal, and that can be very subtle and hard to detect! Additional obvious signs include limping or a change in gait. No one needs to tell you those symptoms indicate pain. Another symptom is licking or over-grooming of a particular area. Bear in mind, over-grooming can also be symptom of skin disease or anxiety, so mention this to your veterinarian! Senior or geriatric cats with arthritis or other diseases can often develop dementia as well. The overlap of symptoms of these diseases makes it even more important to discuss any symptoms you observe to your veterinarian. 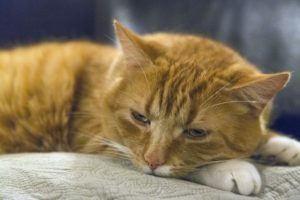 Click here for my article on dementia in cats.